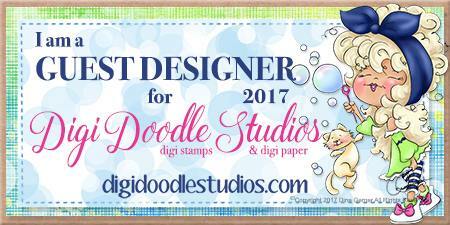 It's my turn to today post over on the Digi Doodle Studios Facebook Page. This digital stamp is called "Kenzie & Kona Lap Dog"! Isn't Kenzie adorable? And that sweet Kona is lapping up all the attention Kenzie is giving her! 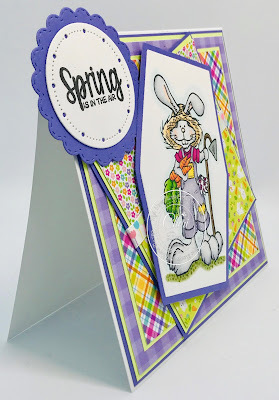 Todays paper is from the new Lawn Fawn Spring Fling 6x6 collection. I made a little cloud background using Distress Oxide Ink with Worn Lipstick and a MFT Cloud Stencil. The flowers and her hair ribbon have Crystal Stickles on them for a bit of glimmer. I popped Kenzie & Kona up to look like they are setting on the fence enjoying the day. 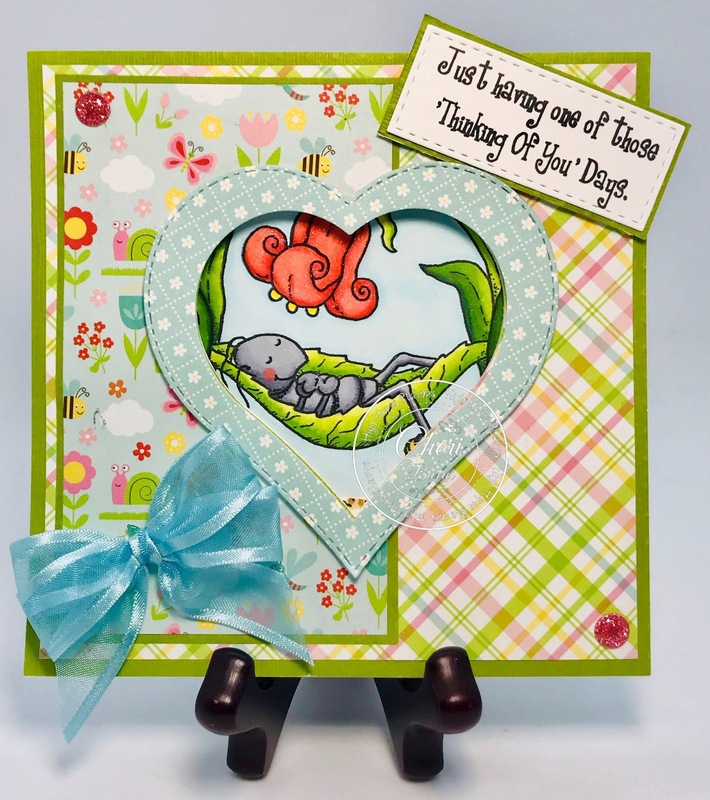 I used some of the paper scraps to decorate the inside and added a sentiment from the Digi Doodles "Cutie Paws" digital collection. 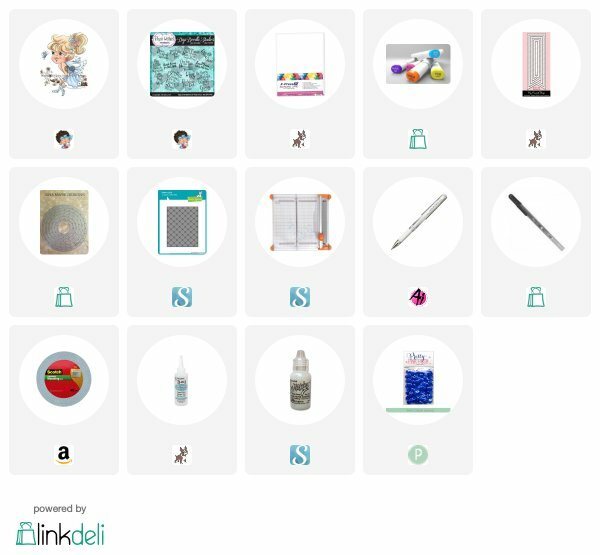 You get 10 pet sentiments in the download! I'm just popping in to share an Easter card that I made for my Hubby's top clients! 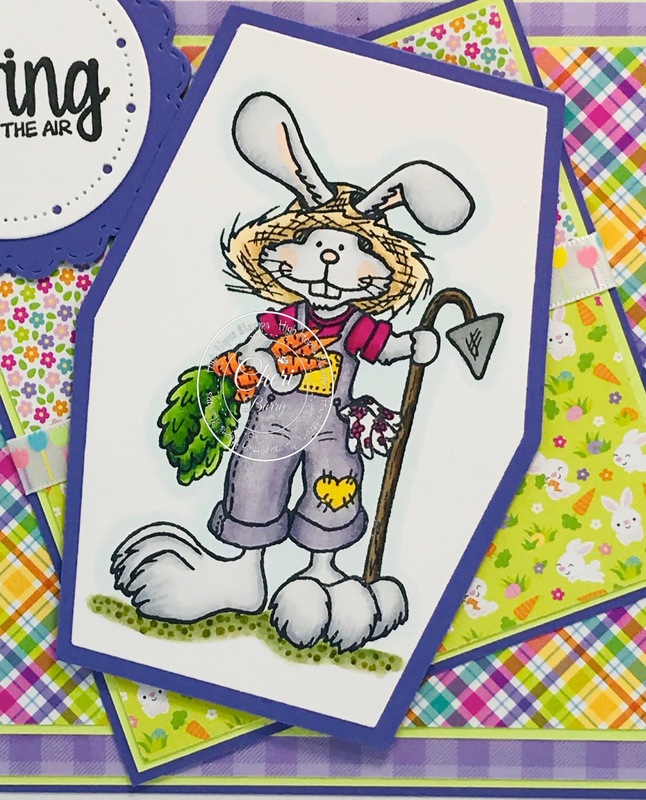 I coloured 60 of these adorable images from Gerda Steiner Designs and made them into cards. This is the absolutely adorable "Peeking Easter Friends" stamp set. 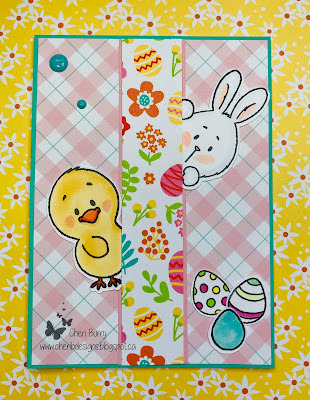 I am using paper from the Echo Park "Easter Wishes" collection. 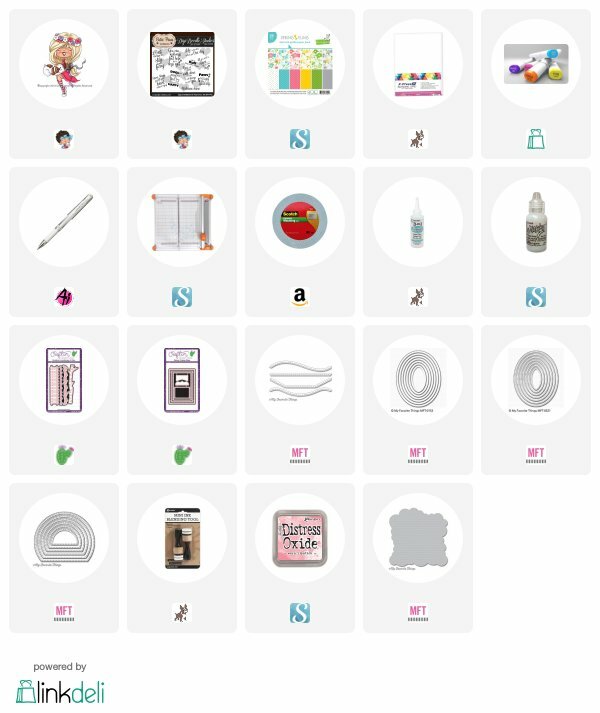 I coloured up all of the 60 images (300 in total lol) with my Copic Markers and then fussy cut them all out using my Brother Cut N Scan. 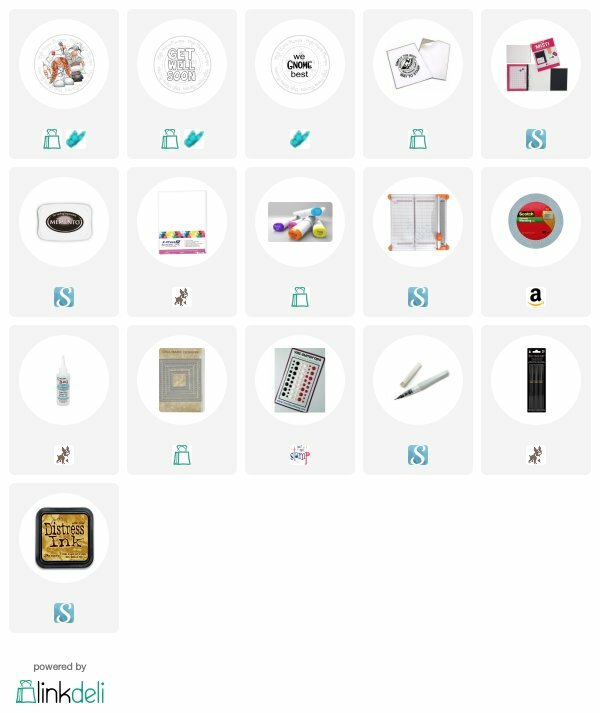 My design is simple as I had so many cards to put together. 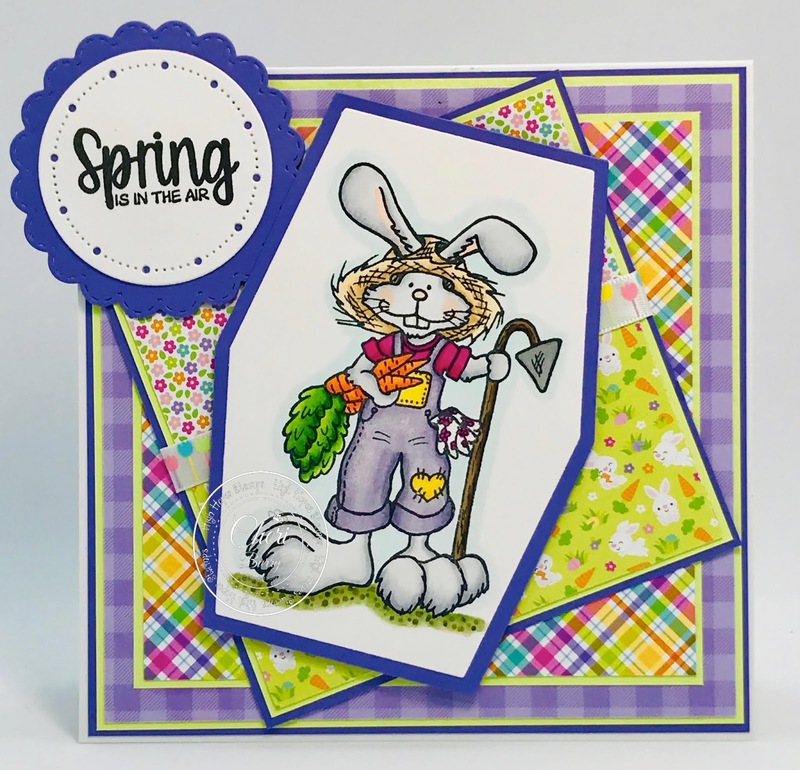 The inside sentiment is also form the "Peeking Easter Friends" stamp set. Happy Tuesday HH & OCS Peeps! 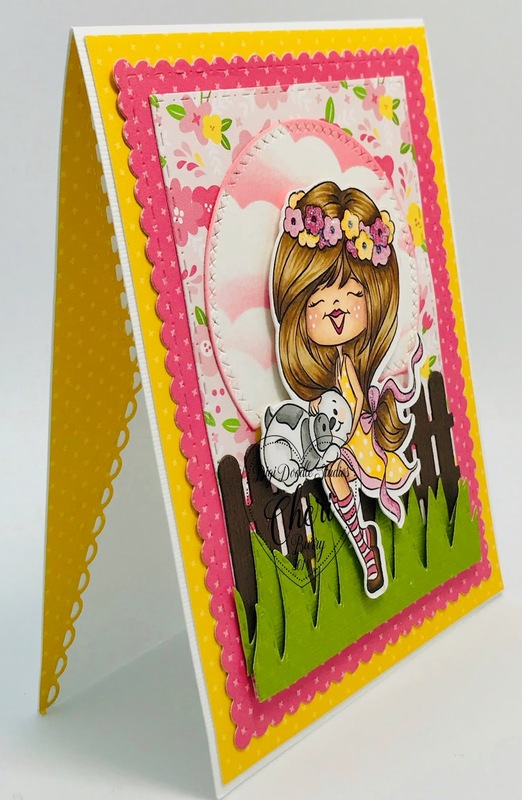 This month over on the High Hopes and One Crazy Stamper blogs, the Designs Teams will be inspiring you with "Thoughts of Spring" themed cards. 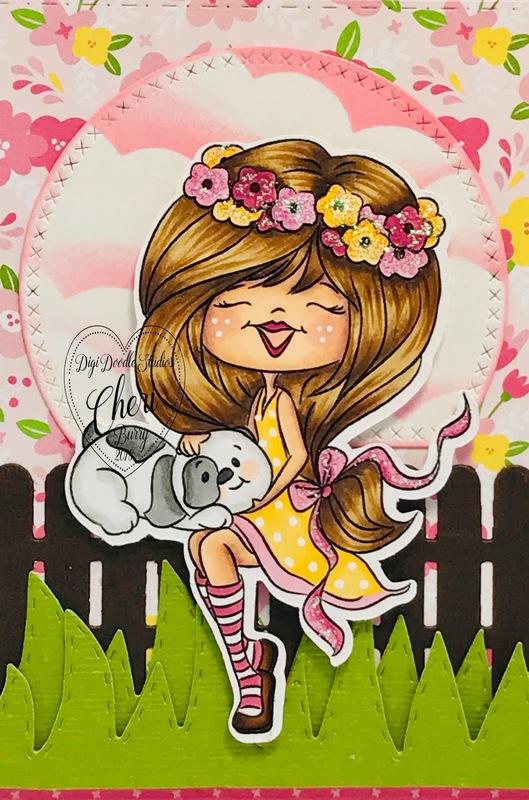 When I saw this stamp called "Sweet Dreams", I just knew it was perfect for the theme! 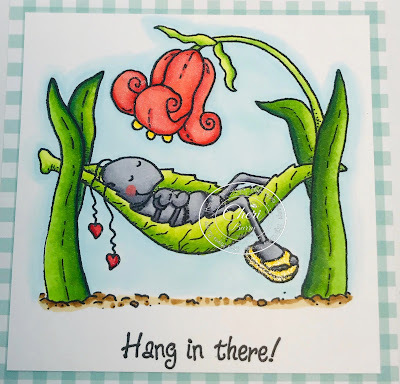 After what seemed like a long Winter, I want to be this cute ant catching some "rays" in a hammock! Maybe he'll switch places with me LOL! 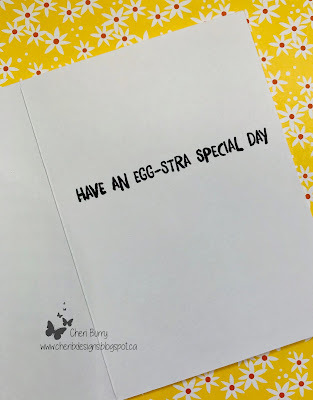 I decided to make a "Window Surprise" card today. 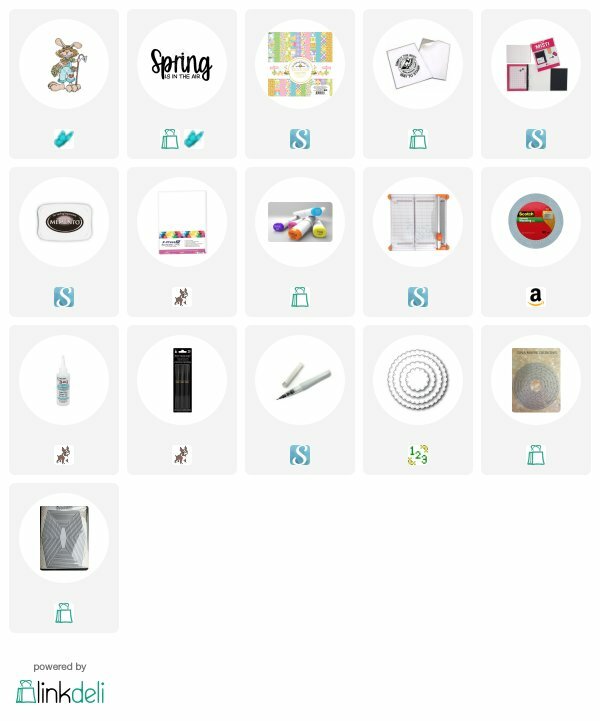 I love how you have a small peak of the image but when you open the card you get a "surprise" with the whole image. 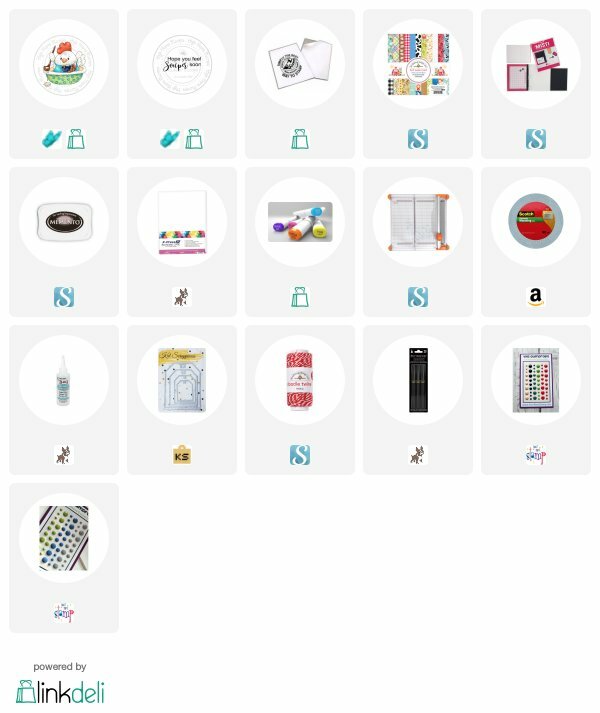 I chose paper from the Echo Park Spring Fling 6x6 pad. The fun patterns and colours just are perfect for a Spring card. After I glued my paper layers together I ran it through my die cut machine to cut out the heart shape. 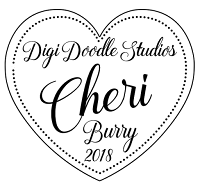 Using 2 different heart sizes I made a little heart frame. 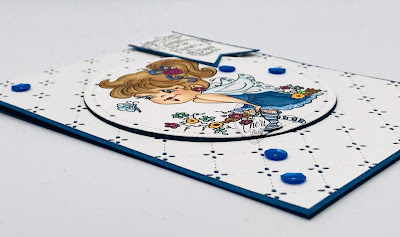 A double bow and some enamel dots finish the front of my card. Here you get an idea of the window. The sentiment is also from High Hopes and is called "One of Those Days". 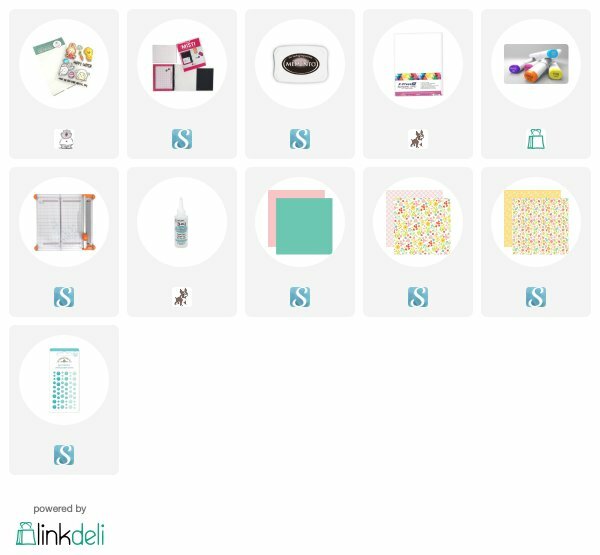 On the inside is the cute "surprise" of the full coloured image. 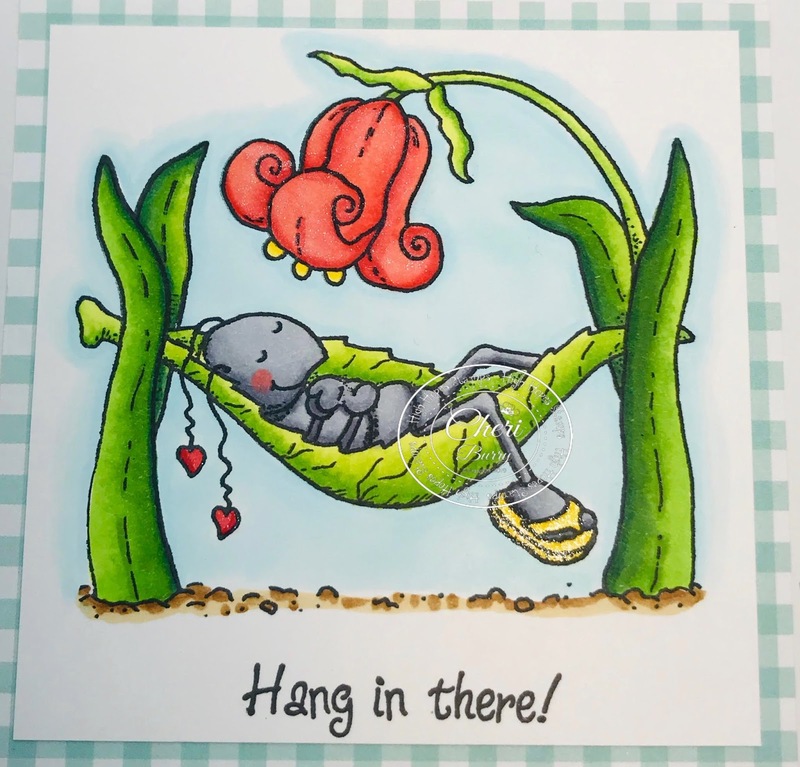 I stamped the HH "Hang In There" directly onto the square die cut with my image. The flower and flip flop both have glitter pen added to them. 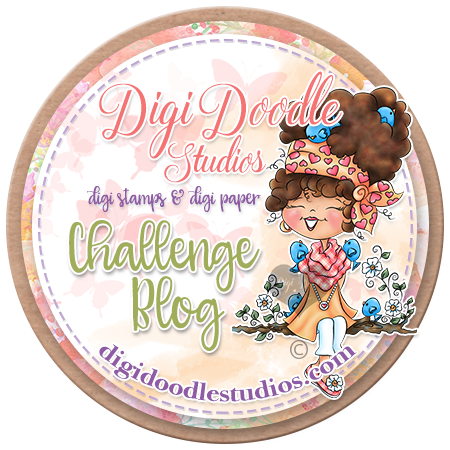 The theme this month over on the Digi Doodle Studios Challenge Blog is "Anything Goes". I decided since it's Spring and that always reminds me of babies that I would make a "Baby Themed" card to have in my stash. 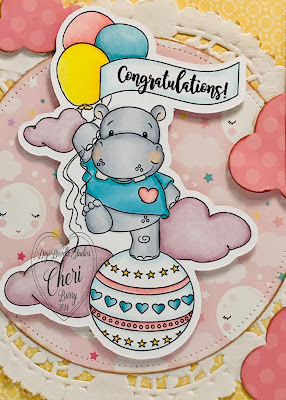 Meet "Hadley Hippo" from the Digi Doodle Studios, "Bundle Of Joy" digital stamp collection. I am using papers today from the Echo Park "Hello Baby, It's Girl" 6x6 collection. I printed my image, coloured it and cut it out with my Brother Cut N Scan machine. I inked all the edges of my papers with Vintage Photo Distress Ink for some added dimension. 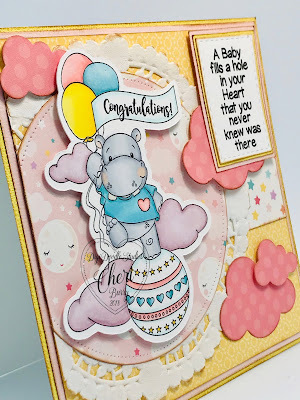 Some glitter pen and a few die cut clouds finish off my card. The glitter never shows up in photos for me but true e it's there lol. 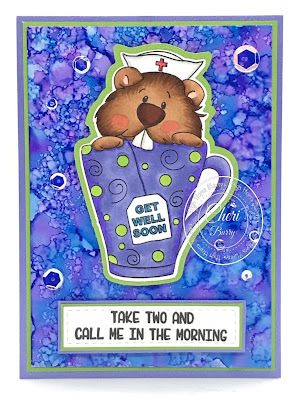 My sentiments today are from the Digi Doodle "Bundle of Joy" digital sentiment collection. 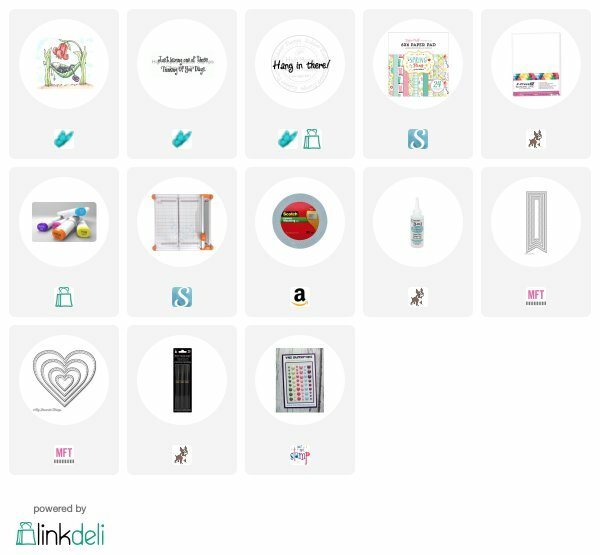 You get 18 sentiments in the collection, what a great value! I added the "Congratulations" to the banner before I printed my image. 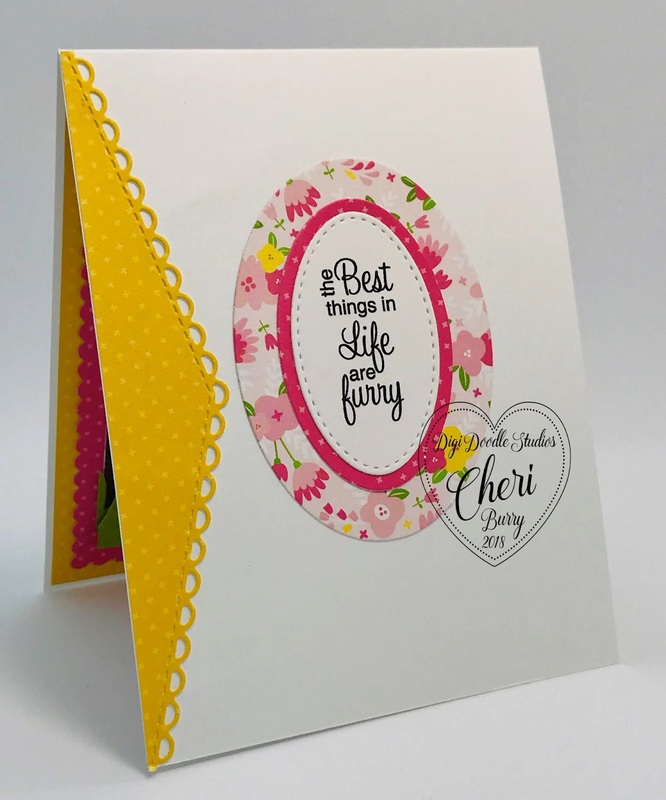 Here you can also see the added dimension by popping the image and sentiment up with foam squares. 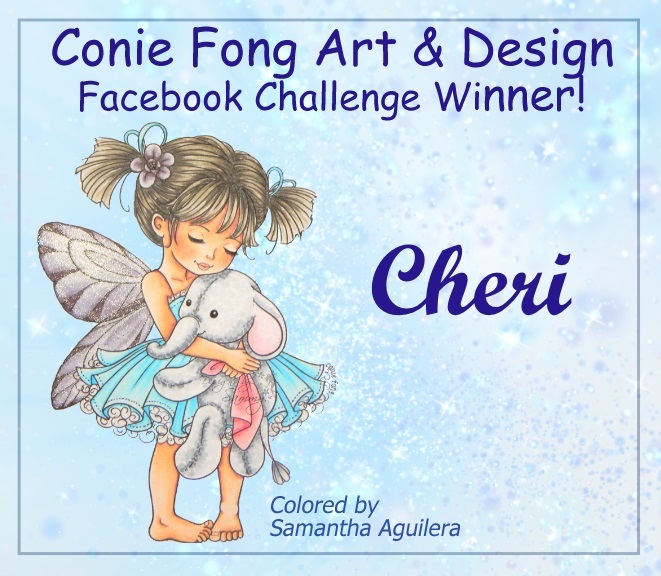 Thanks for stopping by today and don't forget to enter our Monthly "Anything Goes Challenge". 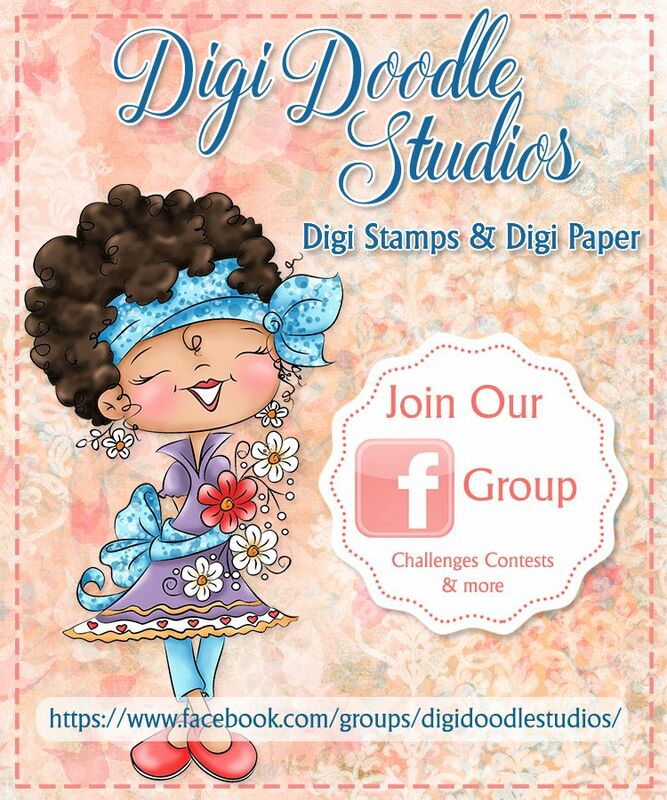 There is also a Facebook Group that has a ton inspiration using Digi Doodle images! Howdy HH & OCS Fans! Oh My Gosh, how cute is this little Gopher?!!! 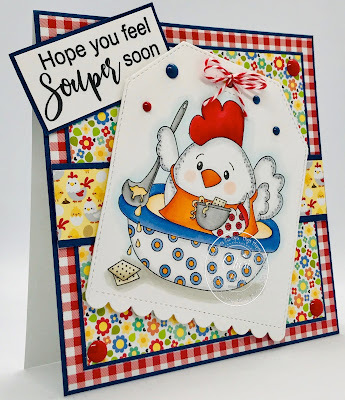 I couldn't resist and had to make one more card from the new High Hopes "Get Well" collection! 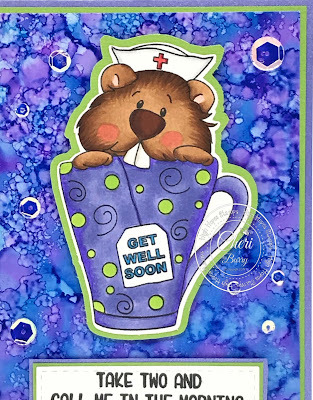 Meet "Gopher Tea Nurse". 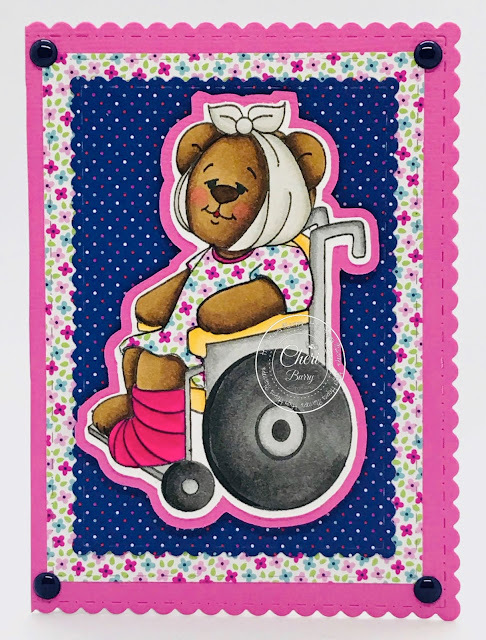 This adorable nurse is sure to brighten your day! This is my first time trying alcohol inks and making backgrounds. 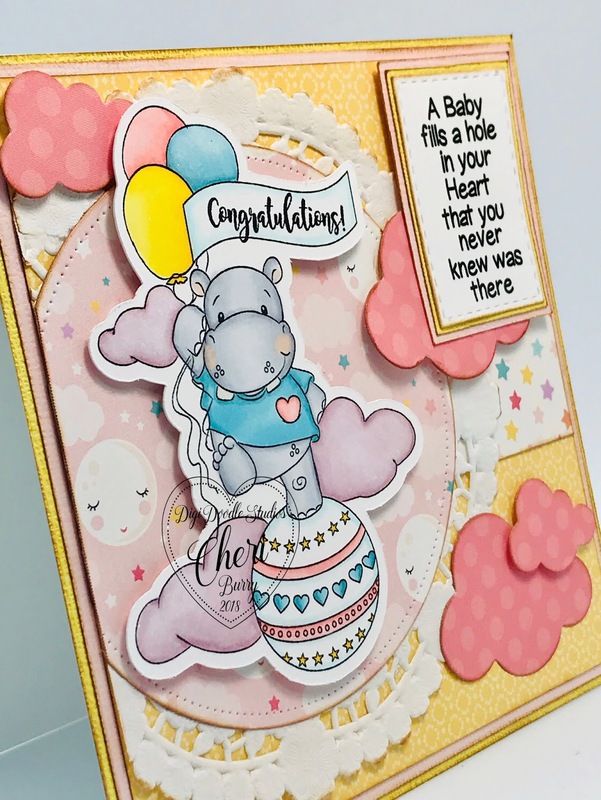 I love the way my background turned out and the marbleizing texture the inks created! I coloured my image to match and cut it and the background layer out with my Brother Cut N Scan. I popped my image and "Take Two" sentiment up with some foam tape for added dimension. 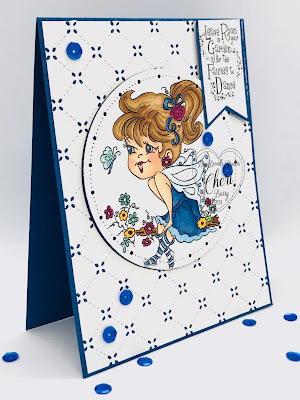 A few Studio Katia sequins finish off my card. 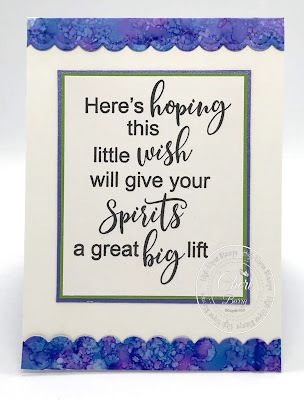 On the inside of my card I used the HH "Spirits A Lift" sentiment. 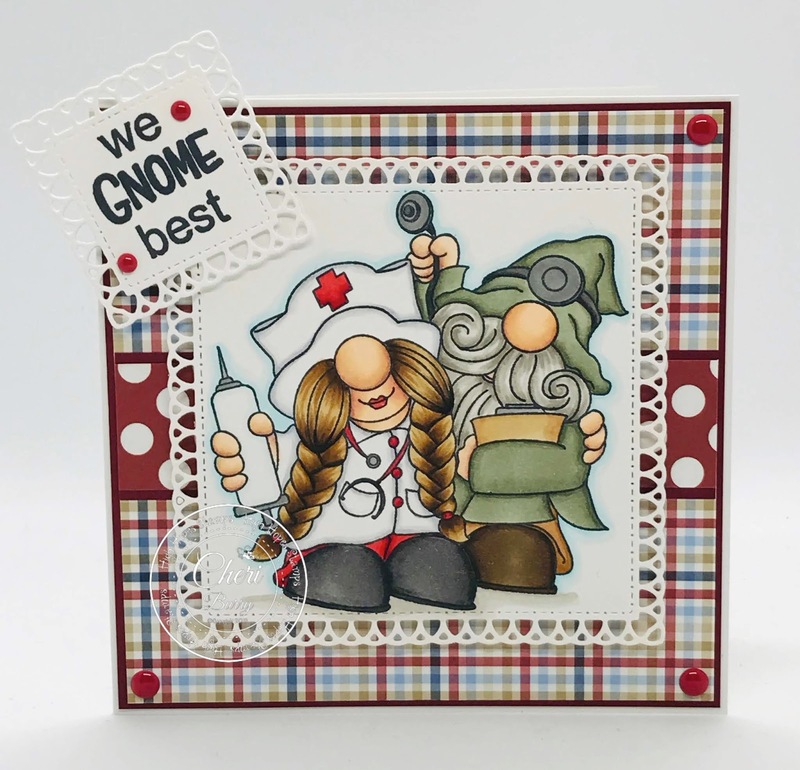 I am absolutely in love with this pair of Gnomes from the new "Get Well" release over at High Hopes Rubber Stamps! 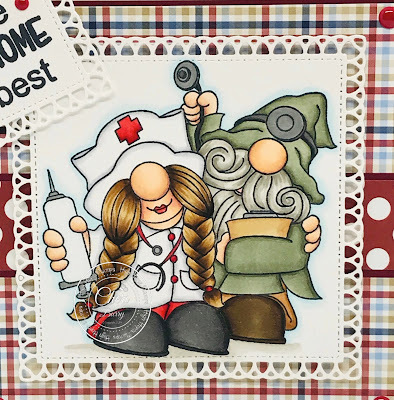 This is the "Gnoming You Better" red rubber stamp. I don't know about you, but if these two walked in my room I'd be cheered up immediately! They just bring a smile to my face! I am using paper from an older Pink and Main "Beach Bum" 6x6 collection on today's card. I stamped and coloured the image with my Copic Sketch Markers and cut them out using the Gina Marie "Loopy Squares" die set. I wanted to colour the male Gnome in "hospital greens" and added glitter pen to the red elements and the medical instruments. 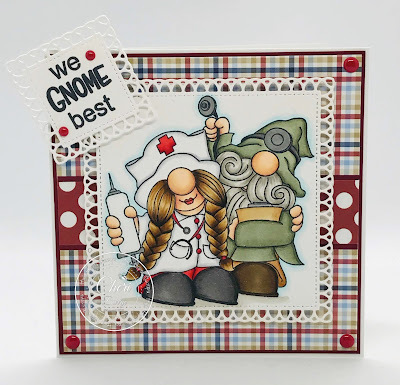 The "We Gnome Best" sentiment is also from the new "Get Well" collection. 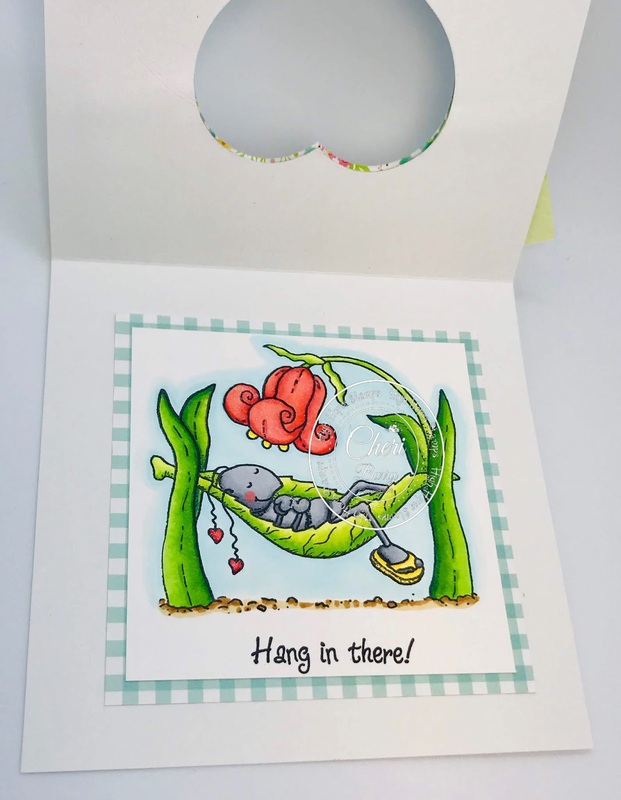 On the inside I used the HH "Stacked Get Well" sentiment and also stamped the "Gnoming You Better" image in the bottom corner with Distress ink in Scattered Straw. 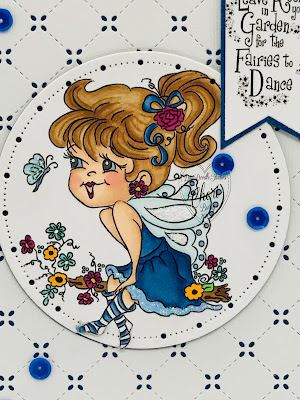 I just love fairies! As a child I truly believed they existed and read everything I could get my hands on about them. I would look in the gardens in search of one and even today I have my own Fairy Garden hoping maybe one will land there! 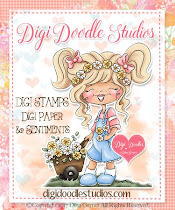 Today's Card uses the adorable "Isabella Curly Girl" digital image from Digi Doodle Studios. I went with a simple design today. 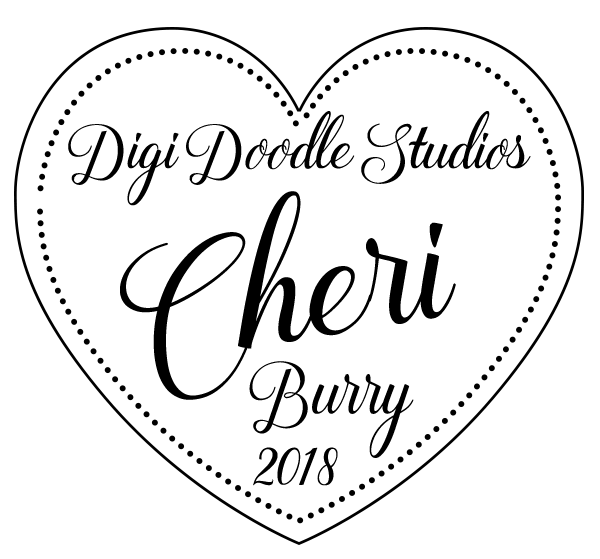 I wanted to show case the image. 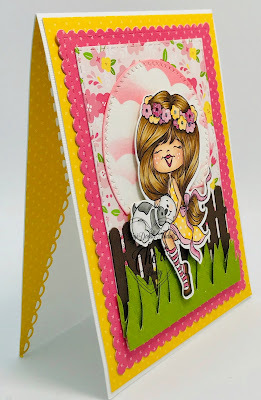 I used my new Lawn Fawn Quilted Backdrop die to create the white background. 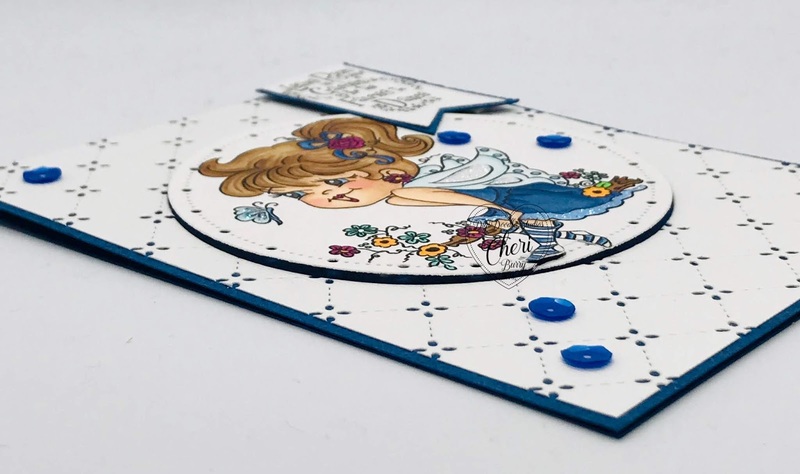 I added blue cardstock behind it so just a touch shows through to match Isabella's dress. Of course all Fairies need a bit of sparkle so I added Stickles to her dress, wings and the little butterfly. Some cobalt blue sequins finished my card off. 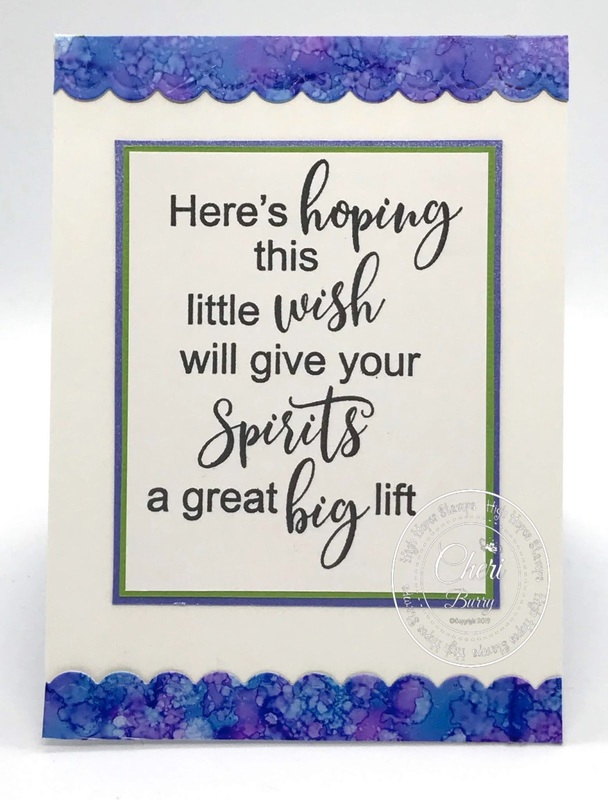 I added a sentiment from the DDS "Pixie Wishes" digital sentiment collection. Here you can see the dimension added to my card. 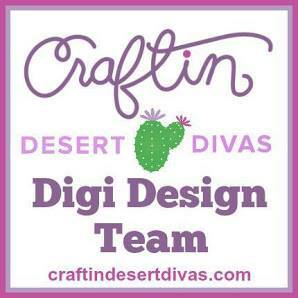 Dimension I feel just adds so much to your projects! 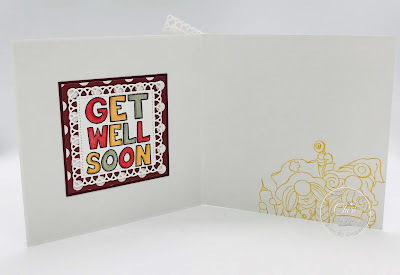 Today I'm sharing another card using a stamp from the new "Get Well" Collection over at High Hopes Rubber Stamps! 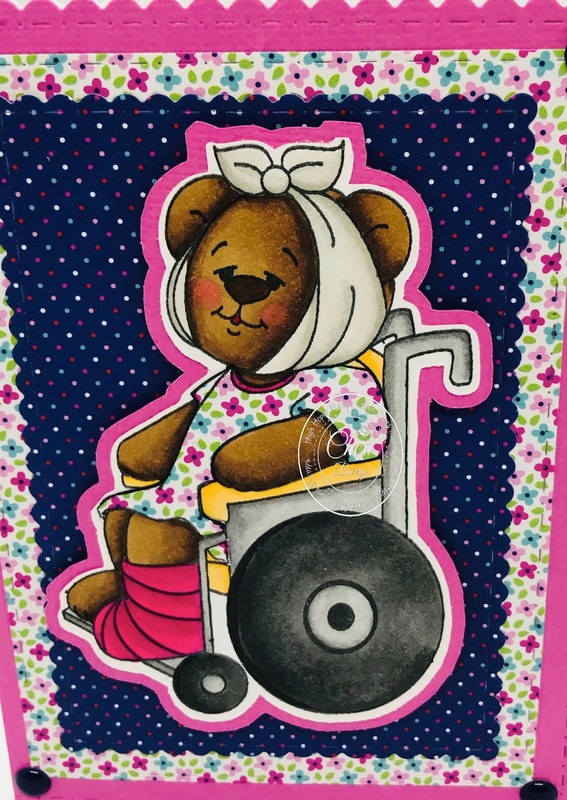 Meet the adorable "Injured Bear". I'm not sure what kind of accident She was in but boy is she stylin' in that flowered hospital gown and hot pink cast LOL! 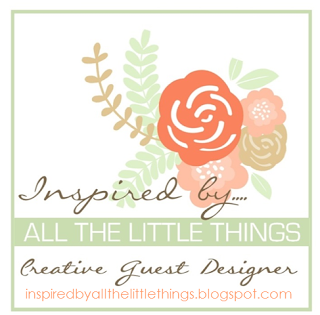 I was trying to look at my dies differently and see how I could use them in a different way. I decided to make the die into the card base rather than adding the cut piece to an already designed base. I made a 4.25 x 5.5 card in pink and then cut it out with the die. I just put the one edge of the die just off the paper so I would still have my fold. It turned into a cute stitched and scalloped card base. Then I added layers using paper from the Doodlebug French Kiss 6x6 collection. I fussy cut my image with my Brother Cut N Scan and then created a back piece for the image as well to give it a bit of definition. 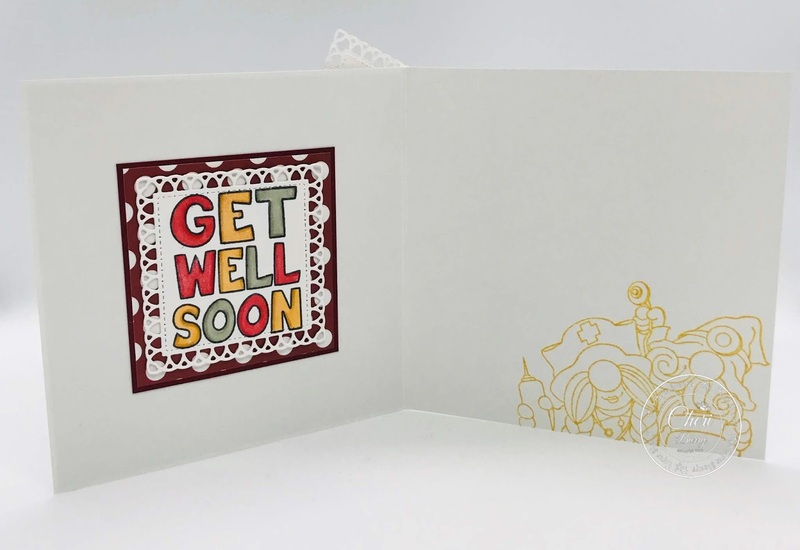 I popped up my layered image with foam tape for added dimension to my card. 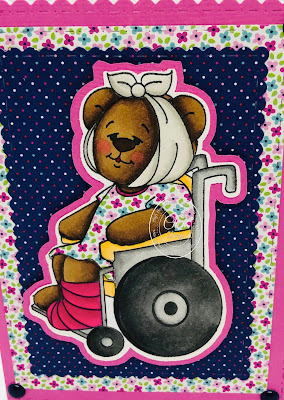 I also added Glitter Pen to the metal parts on the wheel chair although it's hard to see in the picture. I used the new HH "Speedy Recovery" sentiment and some of the leftover papers on the inside. 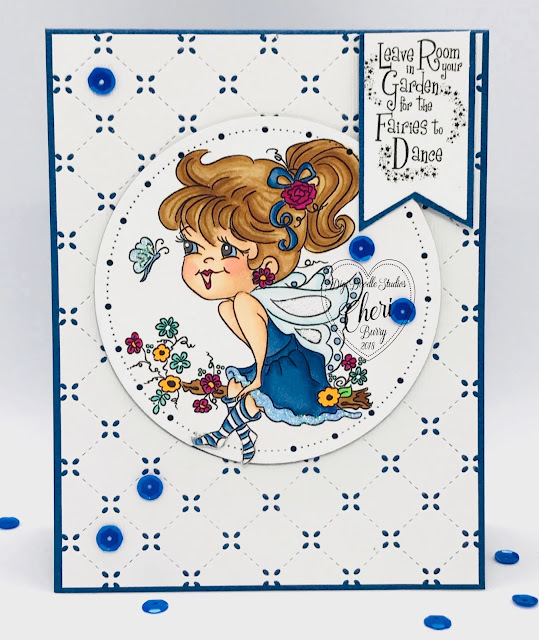 Today's card was more of a simple design with the stamp as the focal point. I hope you liked it! 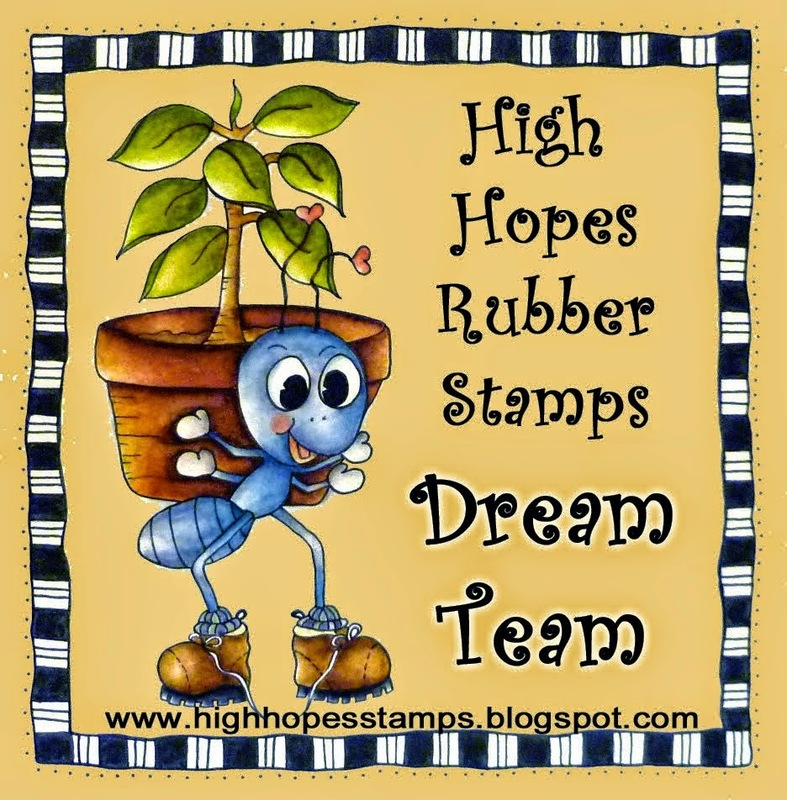 Today is an exciting day over at High Hopes Rubber Stamps! 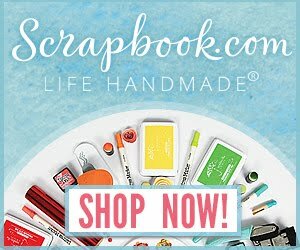 It's Release Day for the new "Get Well" Collection! 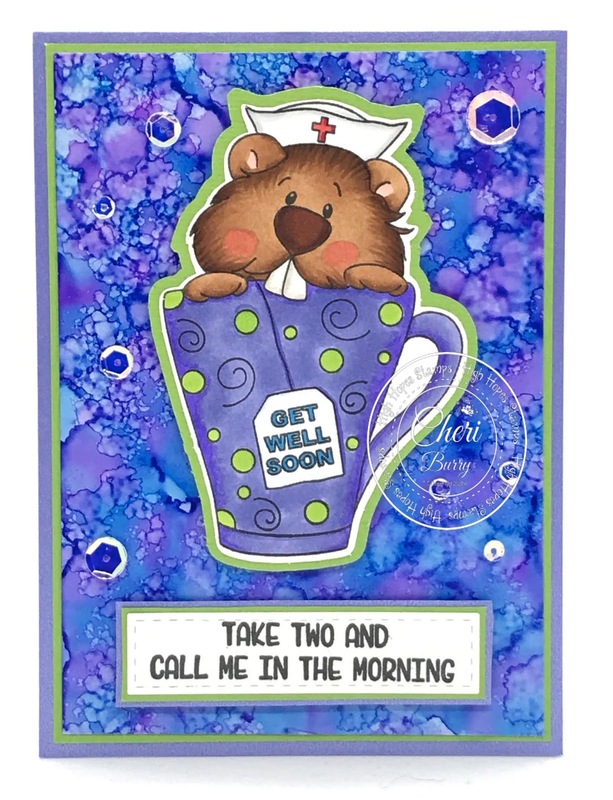 Wait until you see all the adorable images and sentiments in this Collection! 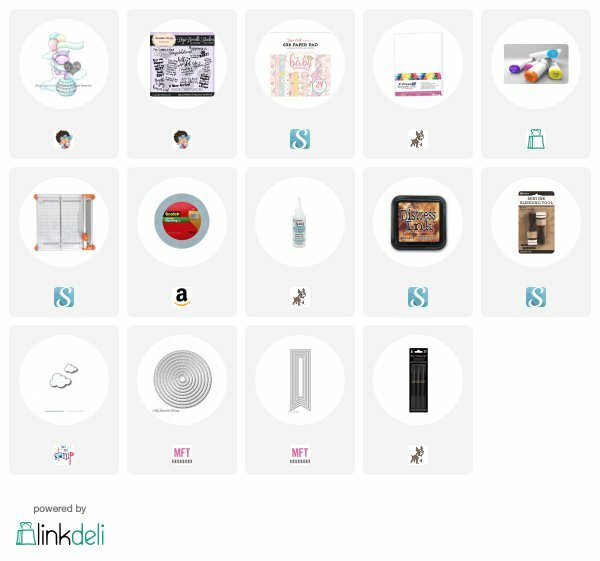 Your wish list is going to be huge LOL! I was excited I got to play with "Chicken Soup"! 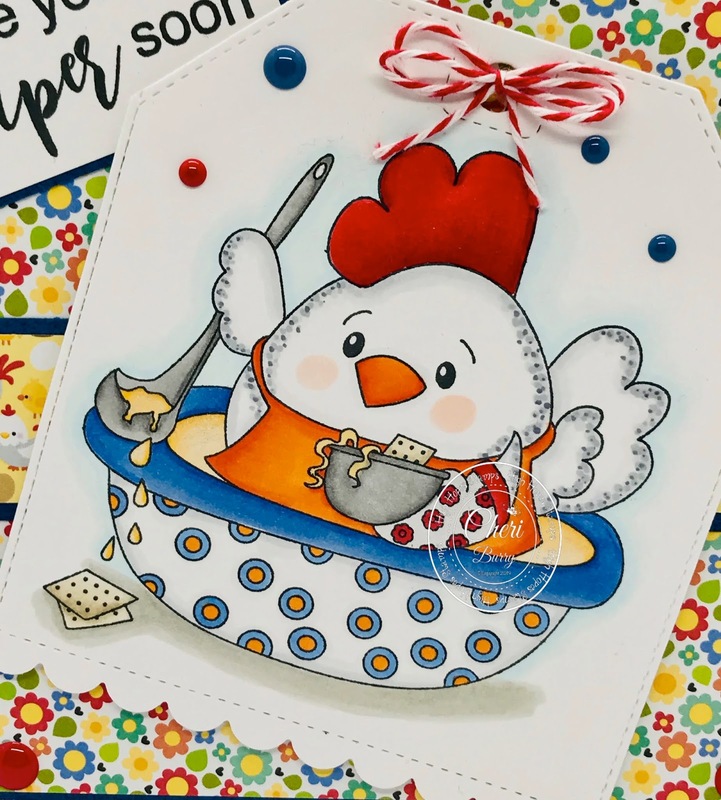 This little guy is just too adorable sitting in that bowl of soup! Everybody knows Chicken Soup cures just about anything and hopefully after having a taste he will be feeling better too! 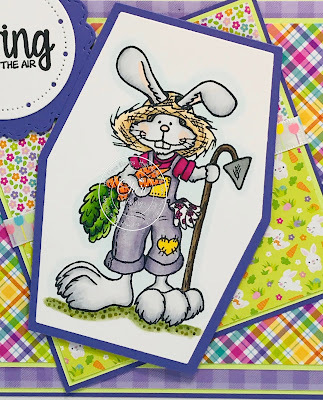 I am using papers from the Doodlebug "Down On The Farm" collection. 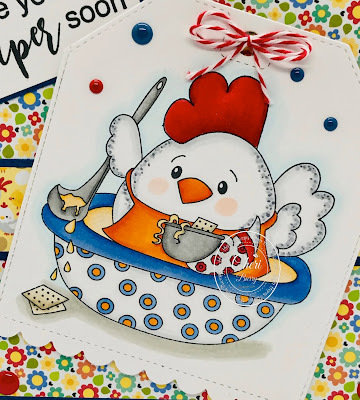 I stamped and coloured my image with Copic Sketch Markers and then cut him out using a die from the Kat Scrappiness Stitched Scalloped Nesting Tags. 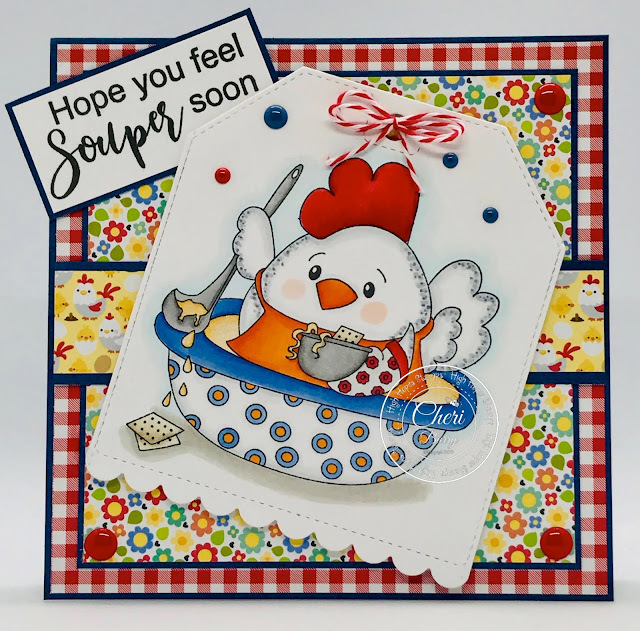 The "Feel Souper" sentiment is also from the new "Get Well" collection. 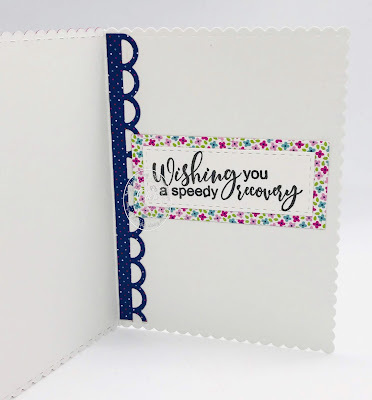 Some enamel dots, twine and glitter pen finished off my card. 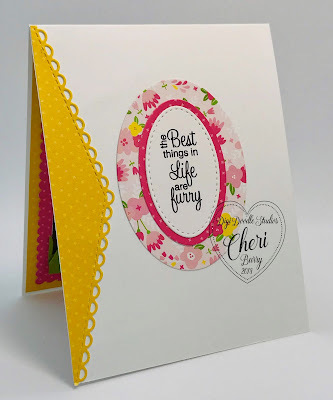 Make sure you stop by the High Hopes and One Crazy Stamper Blogs as for at least the next 2 weeks the Design Team will be inspiring you with cards using the New Release!